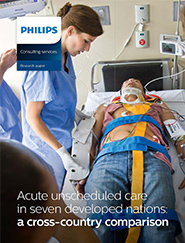 Philips has sponsored an in-depth assessment of acute unscheduled care, the demands on acute care providers, and use of the emergency department across 7 countries: Australia, Canada, Germany, the Netherlands, Switzerland, the United States, and the United Kingdom. 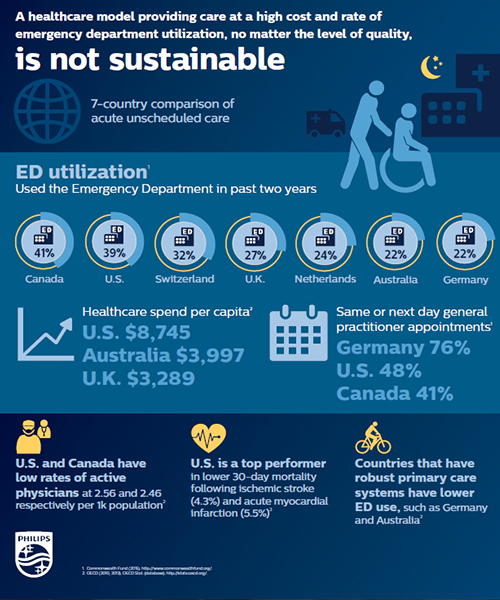 This research paper explores the similarities and differences in the factors leading to acute unscheduled care demands, care decision making, and care delivery in the emergency department and beyond. We hope this paper will open dialogue between healthcare systems and providers as we believe there is much to be learned from each other about acute unscheduled care delivery and quality. Would you like to learn more about our Emergency Department consulting services? You will receive an e-mail with the research paper shortly. We also invite you to visit us online. Please also check your email account's Spam or Junk folder.